We received this letter from Scott Mattoon, a bee advocate who is concerned not just by the killing of the bee tree in Glen Canyon Park’s Natural Areas, but by the reaction of San Francisco Recreation and Parks. If, like us, you were expecting a heartfelt apology – as when the first bee-hive was killed – it didn’t happen. Instead, there’s spin. We publish the letter below with his permission. Rec & Park recently posted an update to their website on the Glen Canyon renovation that I found rather disturbing. 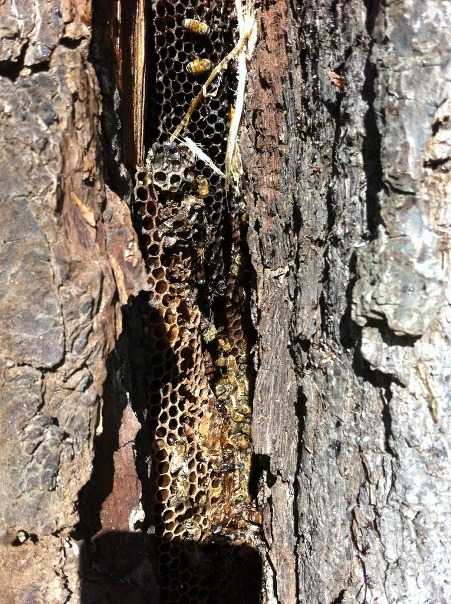 In reference to the plan to preserve the colony of honeybees living in the trunk of a ponderosa pine originally designated for removal, Rec & Park claimed that “the bees … have been preserved“. That’s an interesting spin on what I would describe as a fiasco and careless blunder. The vast majority of that colony died, and with it the likelihood of propagation this year. Rec & Park’s contractor, DeKay, mistakenly cut the trunk at a height of 5 feet, despite an agreement with Rec & Park to cut it at 20 feet. They cut right into the top combs of the colony’s nest, and split the trunk open in the process, leaving the entire nest of this majestic old honeybee colony exposed. If not for the perseverance, vigilance, stewardship, and expertise of two local residents, the colony would have certainly been lost completely. In particular, I commend Karen Peteros for rescuing the queen and a small retinue of nurse bees, and hiving them in another part of the city. We hope they will pull through. Before the cutting began, I was impressed with Rec & Park’s willingness to work with myself and Karen to come up with a plan to save these bees. It felt like we had a true partnership in the making, and that Rec & Park recognized the importance of preserving these bees, especially since their department had recklessly exterminated another colony of honeybees in the vicinity less than two years earlier. It’s easy to assume that losing a colony of bees from the park will have no significant effect on the health or recreational value of the surrounds – just the flap of a butterfly’s wings. But the loss of confidence in Rec & Park’s ability to effectively manage contractors, to coordinate with residents, and to accept responsibility for mistakes is significant for me and others who followed this story. It was an opportunity for collaboration and for preservation of a natural resource squandered. This story is appalling, even for those like me who pay little attention to bees (although I know I should, since without them we’d lack plant fertilization.) This epitaph is telling about the inability of city administrators to acknowledge mistakes. what an awful story! is there any supervision for these projects? certainly orange blobs on a tree shouldn’t be the only instruction. 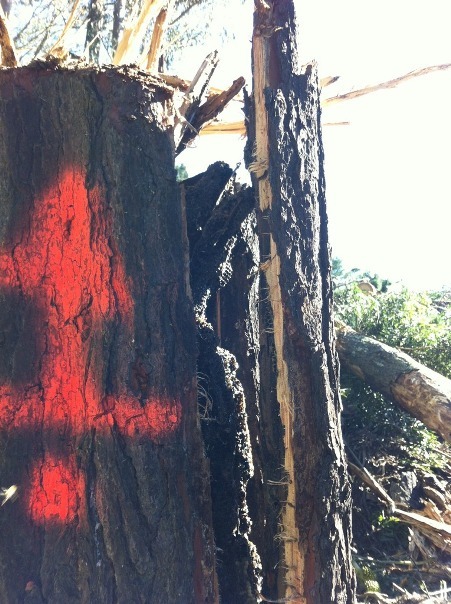 UPDATE: Karen P. reports that the rescued bees from this former stump are healthy and “booming” over in Potrero Hill. Our plan is to return them to Glen Park at some point this season. @Dee_Seligman: bees provide pollination (not fertilization). Pollination is a necessary precursor to fertilization in certain plants. That’s good news, Scott. Hopefully, there’ll be some trees with natural cavities available so they can remain feral rather than becoming a managed beehive (which of course would be better than nothing).